This study examines how the first major military incursions in Sarawak, Sabah and Peninsular Malaysia during the Indonesia-Malaysia Confrontation in 1963-1964 were reported in three selected Malaysian English-language newspapers. These newspapers are The Straits Times, published in Singapore, North Borneo News and Sabah Times (hereafter Sabah Times), published in Sabah, and The Sarawak Tribune, published in Sarawak. This study employed a qualitative content analysis of the newspapers to examine their coverage on the issue. The findings show that The Straits Times generally provided the widest coverage on the first major military incursions in Sarawak and Peninsular Malaysia. Sabah Times, on the other hand, provided the most extensive news coverage on the military raid on Sabah. This was probably due to limited manpower and financial strength of the two newspapers and not the lack of concern of both newspapers and their readers of the situation in the affected localities. CHONG, Wu Ling; SUNDARA RAJA, Sivachandralingam. 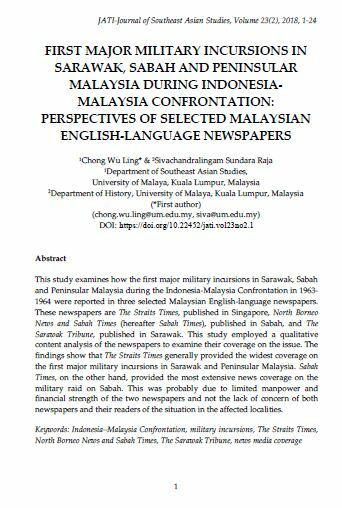 FIRST MAJOR MILITARY INCURSIONS IN SARAWAK, SABAH AND PENINSULAR MALAYSIA DURING INDONESIA-MALAYSIA CONFRONTATION: PERSPECTIVES OF SELECTED MALAYSIAN ENGLISH-LANGUAGE NEWSPAPERS. JATI - JOURNAL OF SOUTHEAST ASIAN STUDIES, [S.l. ], v. 23, n. 2, p. 1-24, dec. 2018. ISSN 2600-8653. Available at: <https://jati.um.edu.my/article/view/15405>. Date accessed: 26 apr. 2019. doi: https://doi.org/10.22452/jati.vol23no2.1.